It took a health scare to convince John that it was time to take action and rid himself of his vices. 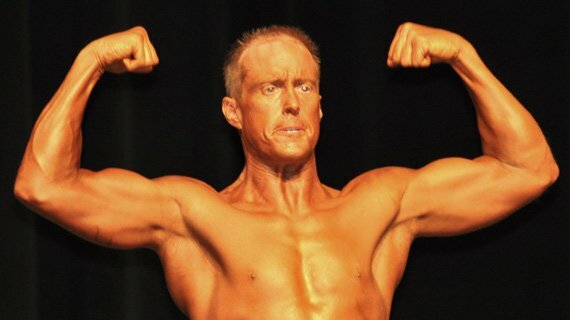 Read on to see how John changed his outlook and showed off his new physique on stage. I had a serious health scare at age 38. It was time to get serious about my health which I had let seriously deteriorate. A quick rundown; I had been fit in my teens, a serious soccer player, and avid backpacker. I developed serious knee problems as a result of poor preventative care of my knees, especially never icing them after years of games and practices on the hard-packed, red-clay fields common in Northern Virginia. I had to take time off from sports in the middle of my high school years, and let's just say I did not do well without a "structured schedule." As I moved on I tried to stay somewhat fit but as you can guess there were many distractions along the way, especially in college. In fact, just two weeks prior to my wedding to my wonderful wife, Susan, I ruptured an ACL that pretty much ended any serious attempts to exercise for the next 12 years. In the interim we had three fantastic children, now ages 12, 10 and 7, which kept me busy and away from any activity that wasn't related to them. Finally, in the fall of 2006 I had routine physical that scared the daylights out of me. It was time to get healthy, quit smoking, quit drinking, quit fast food, and quit making excuses. It was time to get healthy and quit making excuses. I didn't really get my health issues together until 2007 but from then on I have maintained a pretty regimented routine of lifting and cardio. The health scares lead me to utilize my employer's gym, the Fairfax County Employees Fitness Center, where I quickly made friends. The gym director, Chuck Wright, a former NGA bodybuilder, saw my dedication over time and encouraged me to get into serious bodybuilding. Chuck emphasized the positives of bodybuilding, especially after an attempt to relive my high school soccer career landed me with a second ACL rupture and second knee reconstruction. The injury forced me to focus on bodybuilding, and it paid dividends. The final piece was a dedicated training partner with similar fitness goals. With the help of my training partner, Tracy, I got serious in the weight-room. The more I trained, the more confident I became, the more positive feedback I got, not just from gym friends, but from just other folks in the office and friends and acquaintances from other areas of my life. That reinforcement lead to harder training, more positive feedback, and for the first time in my life real confidence I could set goals and achieve them. I finally benched 300, in my 40's, for the first time in my life! Then at 42 years old, after having dropped from a high of 235 pounds to low of 180 pounds, I built back to 195. That is pretty much where I stay weight-wise. When 'bulking' I'll push 210. 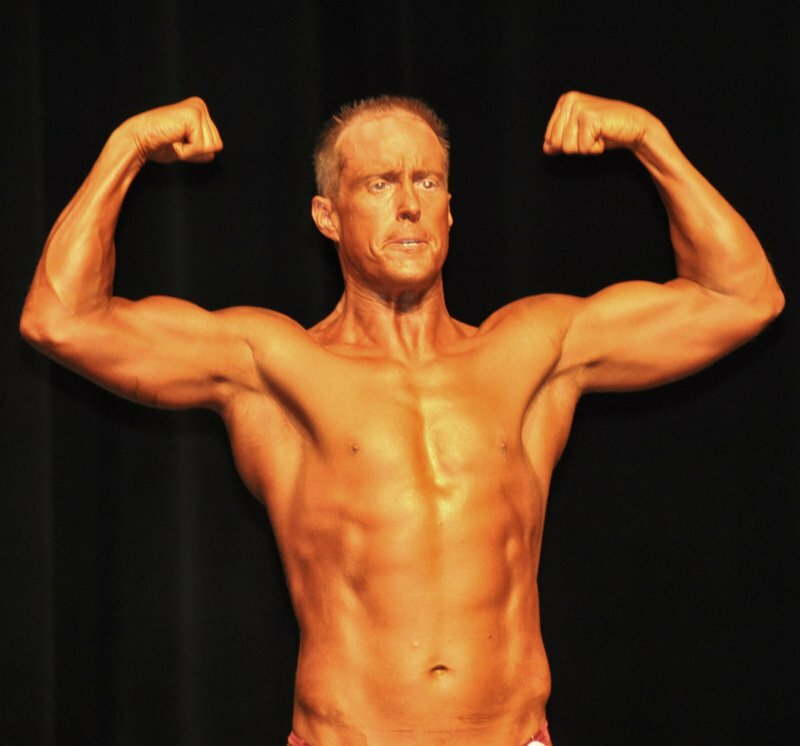 In July of 2010, after a strict cutting diet for 4 weeks that was pretty much egg whites, tuna and green beans, I walked on stage at the 2010 NGA Potomac Cup at 189 pounds and 5.5 % body fat. I placed 4th in Men's Masters and 5th in Men's Novice. 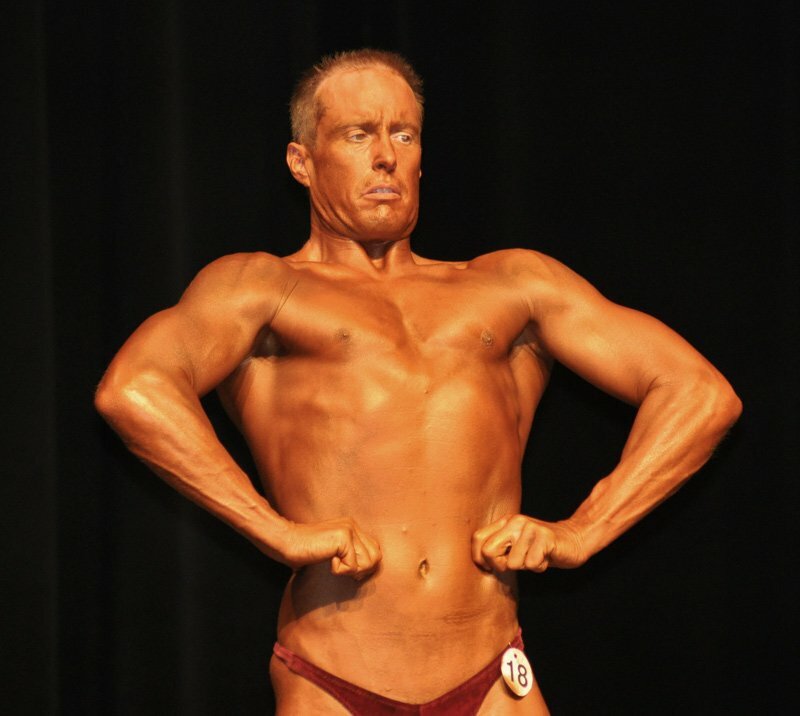 I then competed at the 2010 NGA Mount Rodgers where I did not place, but looked even better if you ask me. 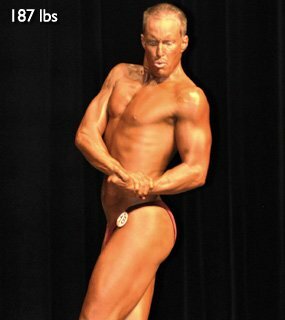 Finally, in April 2011, I went on stage at the 2011 NPA Mr. Virginia, 187 pounds, 4.9% body fat, and placed 3rd in Men's Novice and 2nd in Men's Masters. at 189 lbs and 5.5 % body fat. I sometimes fit in 30 minutes of elliptical on Monday and Thursday nights. Or if I can swing it, make those family swim nights where I get 20-30 minutes to do laps. 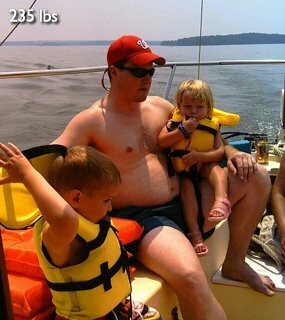 I occasionally do 5k's and sprint triathlons with my family. I also try to incorporate yoga and mindfulness meditation a few times per week for 15 minutes in the a.m. or p.m. to help stay loose. I had one excuse after another for not getting in shape. In fact, if you had asked me, I was in shape; I was just in denial that my shape was round! All the excuses were just that, excuses. It just took action, and it didn't happen all at once. 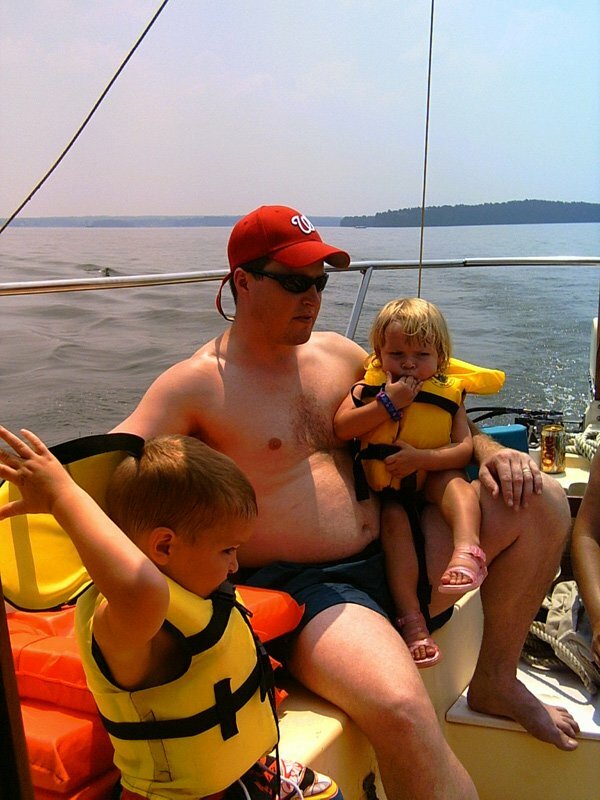 There were plenty of bumps and curves in the road but the realization that I only have one life, and that my children only have one dad, made me seriously re-evaluate those excuses. I had to hit my bottom and I did, like an elevator in free-fall. Then over time, I found through trial and error what would work for me and my family (because life doesn't stop) but through it all I never gave up. I learned that every failure along the way was just a chance to grow and change and accept life on life's terms. Fortunately, before it was too late, I had this life-threatening scare to shock me into action. Suddenly, where there wasn't any time, I found time. First things first! Action! Action! Action! I was fortunate I had access to a gym at work so my time away from the family was limited. In fact, I was fortunate that I had a family that despite time conflicts and some frustration, especially from my wife, still supported me as I sorted out how a new fitness lifestyle was going to work. They had the patience to accept that I needed to make these changes and bodybuilding was helping me make them. Where there were family conflicts I tried to include my family in my training. I now have a 12-year-old daughter and 10-year-old son that have completed several sprint triathlons, and many 5ks. Both are beginning to incorporate sport-specific weight training into their lives and I get to spend time with them learning to lift safely. As a result of the increased leg strength my 12 year old daughter has seen from training, she completed a 10-miler this spring. I also have a 7-year-old daughter that completed her first two 5k's this spring, is totally into yoga, including a yoga club at her elementary school, and is chomping at the bit to join in weight training with her brother and sister. My wife too, a former high school and college tennis player and high school track athlete, has taken up the challenge after many years on the sideline and is getting involved. The excuses, challenges, roadblocks were just examples of a way something wouldn't or couldn't work. I just had to keep searching for the ways that would work. 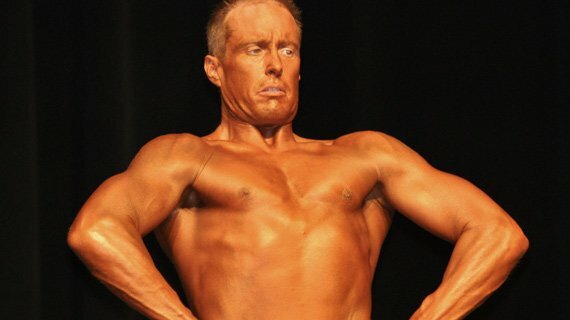 The confidence I gained from bodybuilding kept me searching.